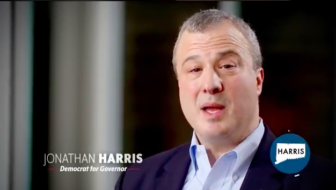 Jonathan Harris, who was executive director of the Connecticut Democratic Party during Gov. Dannel P. Malloy’s re-election campaign in 2014 and then oversaw the Department of Consumer Protection for three years, joined the evolving field of Democratic candidates for governor Saturday. Harris, 53, a former mayor and state senator from West Hartford, enters the race having demonstrated an ability to raise the $250,000 necessary to qualify for public financing, while lacking the name recognition of former U.S. Senate nominee Ned Lamont and former Secretary of the State Susan Bysiewicz, two rivals who each have run for statewide office. He kicked off his campaign by posting a video announcement on his web site, followed by a press conference with supporters in West Hartford. Harris left the administration in April to begin fundraising as an exploratory candidate. As of Jan. 1, Harris had raised $232,745 and spent all but $36,861. The two-day nominating convention opens May 18. Qualifying for the primary on August 14 requires support from 15 percent of the delegates. His tenure as executive director helped him establish relationships with many Democrats who will be convention delegates in May, but it also reinforced his connection to Malloy, who is leaving office with fewer than 25 percent of voters approving his performance. Connecticut was one of the few bright spots in the 2014 mid-term elections for Democrats, who retained control of the General Assembly, all congressional seats and the six statewide constitutional offices, including governor. But Republicans accused the party of illegally funneling contributions from state contractors, who are barred from giving to state races, into a federal account to support the re-election of Malloy. After Harris left the job, the party dug in, fighting the authority of the State Elections Enforcement Commission to subpoena party emails and fundraising documents. The case was settled in 2016 with the Democrats agreeing to make a record payment of $325,000 and dropping its challenge to the commission’s jurisdiction. The party admitted no wrongdoing. “We followed the law, it was fully investigated and no wrongdoing was found,” Harris said. Harris said his broad experience in local and state government, as well as being a lawyer who worked on economic development, give him the necessary skills to govern. While overseeing the town council as mayor of West Hartford, the suburb doubled its town center with a public-private development of housing, retail and commercial space called Blue Back Square. The race to succeed Malloy is wide open. The state’s two U.S. senators, its five U.S. representatives and six statewide constitutional officers, all Democrats, have passed on a contest to become chief executive of a state struggling with a stagnant economy and crushing unfunded pension and retiree health liabilities. The first Democrat in the race, Middletown Mayor Dan Drew, quit last month, struggling to raise money and facing the prospect of competition from Lamont and two others now raising money with exploratory campaigns, Bysiewicz and Hartford Mayor Luke Bronin. The declared Democratic candidates include Bridgeport Mayor Joseph P. Ganim, whose public corruption conviction bars him from seeking public financing, former Veterans Affairs Commissioner Sean Connolly and a former corporate communications executive with no political base in the the state, Guy L. Smith IV. Dita Bhargava, a former Wall Street executive who lost a state legislative race in Greenwich in 2016, quit an exploratory campaign last week and intends to become a candidate in the open race for treasurer on Monday. Secretary of the State Denise Merrill and Comptroller Kevin P. Lembo are the only statewide constitutional officers seeking re-election. After six years in the state Senate, Harris ran for secretary of the state in 2010, losing the party’s endorsement to Merrill. He qualified for a primary, but ended his campaign less than a month after the nominating convention. He briefly served as a deputy state treasurer, then became the executive director of the Democratic Party. As the commissioner of the Department of Consumer Protection, he oversaw the state’s successful implementation of a law allowing the production and sale of marijuana for medical use.